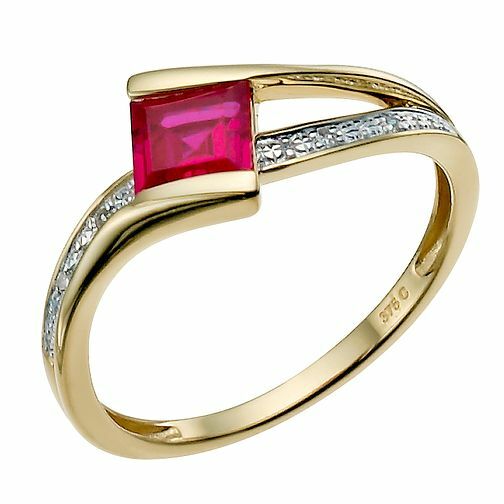 A square, created ruby is set between the arms of an open, 9ct yellow gold ring. Finished with elegantly embellished diamond shoulders, this is a unique ring which combines classic with style. 9ct yellow gold diamond & created ruby ring is rated 5.0 out of 5 by 3. Rated 5 out of 5 by Anonymous from Beautifully designed ring Beautiful ruby ring for our anniversary, wife didn’t want traditional cluster and this fitted the bill perfectly! Very easy transaction and fast delivery. Rated 5 out of 5 by Anonymous from Unusual ruby ring I was looking for a ruby ring as a treat for myself. I was assuming that I’d buy a fairly traditional oval ruby surrounded by diamonds but then my husband pointed this one out. It is an unusual setting, quite modern in style and the design makes the ruby stand out. I really like it. I was surprised to discover that it is a created ruby but as it has the same composition as a natural ruby I am ok with that.